Overall this September has been a surprisingly good month for my roses here in San Diego, inland. Hope you enjoy seeing them as much as I did! 'Marie Pavie', an old Polyantha bred in 1888, is still going incredible strong and pumping out one flush after the other. I really like the intense musk fragrance and I am happy that I planted her at the walkway to the front door so that I get to enjoy it often. When the conditions are right (temperature, time of the day, and humidity level) the fragrance even wafts. I am also quite happy with the way the 'Black & Blue' salvia is interweaving with 'Marie Pavie'. Not the best photo, but I have to show you this bloom of my new Miniflora 'Overnight Scentsation'. 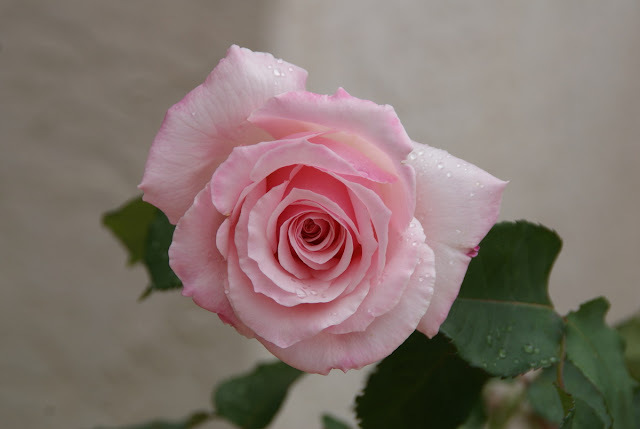 The rose has a very nice flower shape and the scent is fairly strong as indicated by its name. Unfortunately it mildews quite a bit so far. I am thinking of planting it in a container on the terrace and wonder how tall a Miniflora would become here in Southern California. If you have any idea, please let me know! 'Our Lady of Guadalupe' also planted by the walkway to the house is still producing clusters of her astonishingly beautiful blooms. Right now she is getting some peachy undertones, which I like equally much as when her flowers are a cool silvery pink color. 'Captain Christy' a very early Hybrid Tea rose from 1873. I am in love with the cabbagelike flowers and the sublte very light pink coloration that reminds me of the finest porcelain. I grow this rose own-root and it is still only in two gallon pot so I assume, once it is planted in the ground the blooms will be even bigger and prettier. This is 'Neptune' besides 'Sweetness' my second lavender colored rose opening one of its perfect exhibition style blooms. Its color is a little bit lighter than the one of Sweetness and the flowers seem to have slightly less petals. Foliage is very healthy so far. Here is a shot from the side of 'Neptune' where you can see how symmetrical the flower is build. As I said: just perfect! For a comparison on the photo above is pictured a bouquet of 'Sweetness' blooms with only one flower of 'Neptune' (it is the one in the middle facing the wall). With a little good will you can see that Neptune's color is a lighter more mauve/pink lavender than the really blueish lavender color of 'Sweetness'. I am really happy that some of my rose bushes are finally so mature that they produce enough flowers to cut little bouquets and not just single blooms. I love cutting them for indoors or giving them away to friends. The filler plants are rosemary and lemon verbena and came from a friend (thank you for those Shahrbanu!) and are going nicely with the lavender color of the roses. I would not necessarily think autumn when I see lavender colored roses, but this little plonk definitively has a tough of autumn in my eyes. 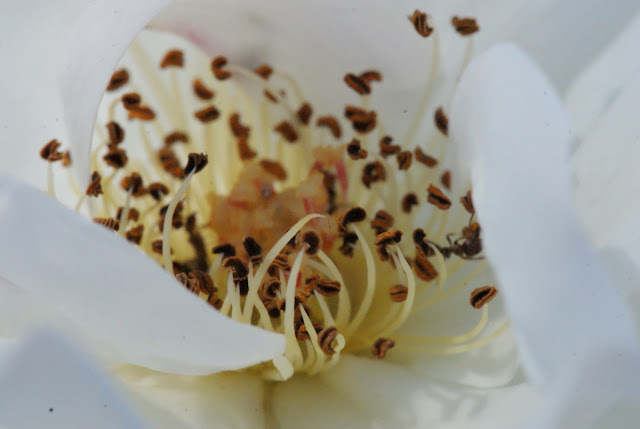 A fully open 'Georgetown Tea' flower photographed with back light. I love the informal, loose style of the blooms of this rose. It always reminds me of ballerina tutus. 'Stephen's Big Purple' is a new Hybrid Tea rose for me. It is already my second try with this variety. The first band died after it was eaten by rabbit twice at a very young age. Looks like with this one I am having more luck. The canes are still a little bit weak so the flowers nod, but I believe that this will correct itself as the rose matures. The color is even more saturated in reality than my photo shows and the fragrance is truly great. 'Sutter's Gold' an older Hybrid Tea at an early stage of opening. 'Sutter's Gold' again, fully open. Usually orange roses are not so much my cup of tea, but this one is quite fascinating in terms of the coloration. In the meantime I also can appreciate the loose informal style of the blooms. The scent of this rose is outstanding and in my opinion it is worth growing 'Sutter's Gold' for its fragrance alone. 'Sweet Chariot' is a lovely little miniature rose that I acquired by the end of last year. It comes with a really strong damask fragrance, which is fun for the olfactory sense to explore. The rose has been very healthy for me so far. It is a prolific bloomer that produces one flush after the other. 'Pope John Paul II' looks almost as good as in spring. This is an exceptional good white Hybrid Tea rose for me, even though I have read that some people complain about the lack of vigor. All I can say is that in my garden it is just great! 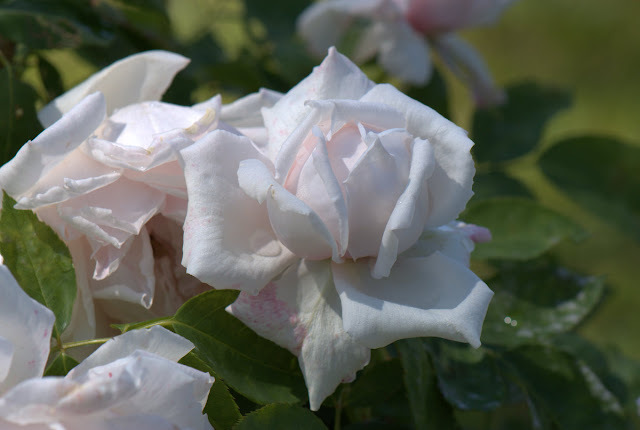 'Anna Pavlova' is a Hybrid Tea rose that is very dear to me. I find her beauty out of its world and even though there are many, many light pink Hybrid Tea roses out there her flowers are one of the very best to me. Comes also with a very lovely scent. This rose deserves to be grown more widely. 'Charles Darwin' has more orange in its coloration than usual, but it changes into a more yellow color as the bloom matures. This rose is completely healthy for me from day one since I have it. Its a winner in my garden! Close-up of the stamens of 'Iceberg' with ant. The photo was shot by my husband playing with his new macro lens. You've met my need for a lavish bouquet of roses, albeit, in the virtual blogosphere. These are beautiful! I'm thinking of adding Marie Pavie to my garden. So glad you included her. And combining her with black and blue salvia - gorgeous! Your 'Our Lady of Guadalupe' is so romantic looking. Just beautiful. And how nice to have a macro lens! Oh Christina ~ I always LOVE seeing your beautiful roses. 'Our Lady of Guadalupe is always a favorite, and I love Neptune and Sweetness, and Charles Darwin tugs at my heart. Great macro by your DH. Wonders of the autumn ! I always love the colours of the roses in this time of year ... sweet blooms ... A rainbow of roses, Christina ! Bay Area Tendrils, welcome to my blog! I am glad that I could satisfy your longing for a rose bouquet :-)! Holley, 'Marie Pavie' is a great rose here, but FYI in the hottest times of the year her rose petals wilt or even fry. In case you get her I am curious to know how she will do for you in Texas. Can't wait to see photos. Hope I get to borrow my husbands macro lens ;-). FlowerLady, it makes me happy to read that you love my roses. All your four rose favorites are gorgeous roses and except for 'Our Lady of Guadalupe', which mildews a little at times, are very healthy. 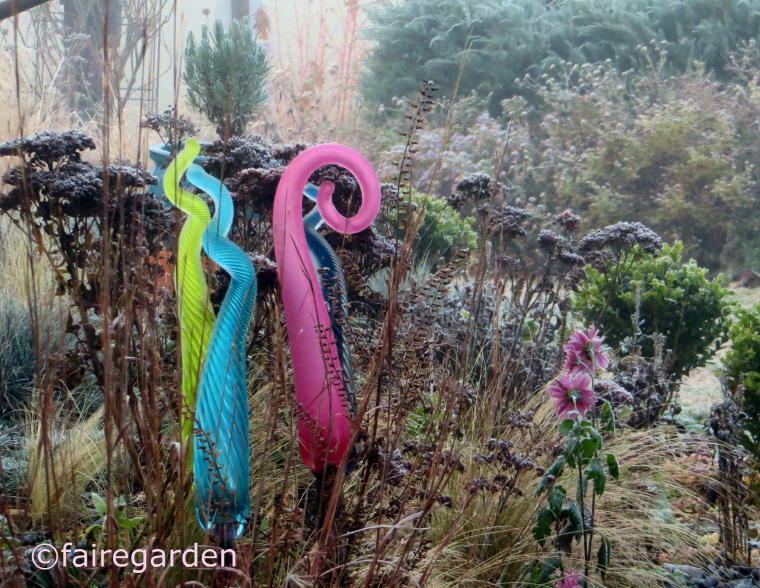 You might consider trying them out in your own garden! One can never have enough roses :-)! Mihai, nice to see you visiting my blog again, I am glad that you like my roses! Dani, thanks. Your are right there is something special to the autumn colors of the roses. Hope I get many more blooms this year. beangenie, welcome to my blog! I am happy that you found me through Blotanical. 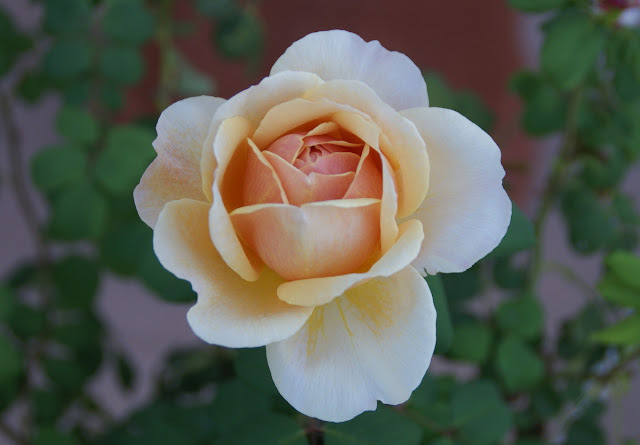 'Sutter's Gold' is indeed a wonderful rose. I am glad you like this one especially! How beautiful your roses are! 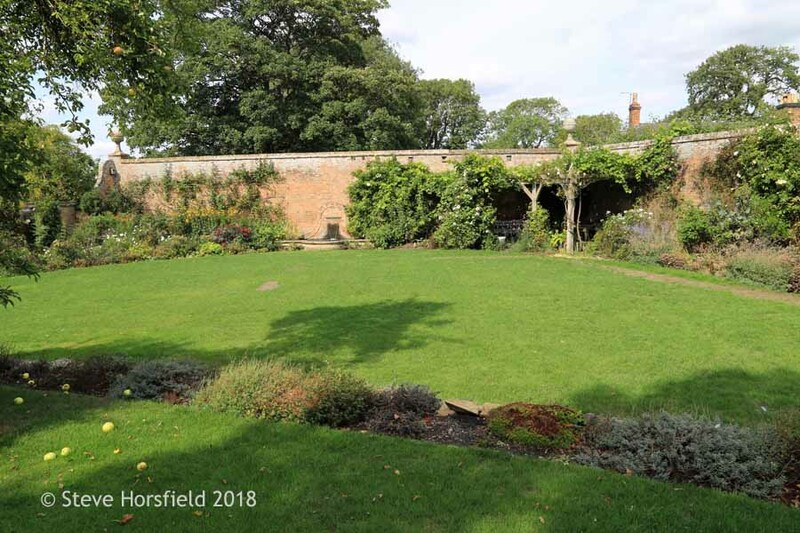 Yesterday I visited an English rose garden and the roses are just going over. Yours look at their peak! In my own garden, there are one or two plants still going but the dreaded black spot has come to call. Sometimes I wonder if they are worth the space, but seeing yours makes me realise they truly are. Martin, thanks for stopping by again and your compliment regarding my roses. The California sun certainly helps :-)! Black spot is a dreadful rose disease. 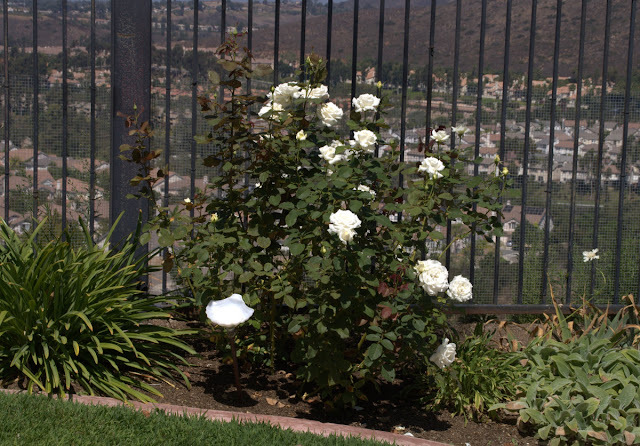 Here in San Diego I don't have much of it, but my roses can badly suffer from powdery mildew. For me a cruel rose selection process is key. If a rose is constantly sick it has to leave my garden and make space for a more healthy one. Perhaps it would be an option for you trying to find more black spot disease resistant roses, too? Who doesn't love roses? You have some gorgeous blooms! Christina, the bouquet is lovely and, by the way, the pattren on the tabletop is beautiful too! 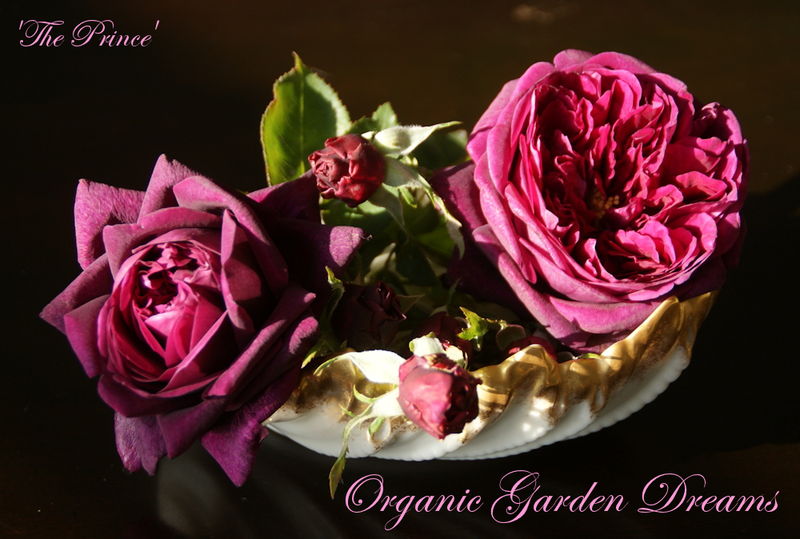 Thank you very much Tatyana for your kind words regarding my roses. I love the table, too, but unfortunately it is just a loan from friends that we have to return some day! I enjoyed my vieuw at your blog. I am a roselover. In our country it was not a good year for the rose because of the loads of rain we got. Especially the blue roses did not show their beauty. Maybe next year. Beautiful photo's of the roses. Hi Marijke, welcome to my blog and thanks for your nice comment! I am glad to meet another rose lover! Sorry to read that this year has not been the best for your roses, hopefully the next will be better, again. Wishing you a nice weekend, too! Your September garden is wonderful! I especially like the blooms of Marie Pavie. redneckrosarian, nice to see you stopping by, again! Thanks for your compliment regarding my garden. 'Marie Pavie' has been one of my favorite roses this month, too! Another great thing about her is that her foliage is completely healthy right now. I wish I could say that of all of my roses! Christina, I have 2 new Overnight Scentsations and they're great in our very dry climate. I long for a Sweet Chariot. All the photos are lovely; compliments to your husband on his closeup! Sandra, so nice to see you stopping by, again! Oh, that is good to hear that 'Overnight Scentsation' is doing well for you. Would love to see photos of yours. 'Sweet Chariot' is a great rose here and no foliage disease at all. You should really consider getting one! Thanks for the compliment regarding the photos!